La Chaudière is proud to offer you certified organic raw milk cheeses. Our milk comes exclusively from herds of family operated farms. Our goal is to offer consumers tasty, wholesome products realized through environmentally responsible organic farming methods. Organic foods are produced without the use of synthetic pesticides and fertilizers and are minimally processed to maintain the food’s integrity without artificial ingredients or preservatives . By choosing organic foods, concerned consumers can help support sustainable agriculture and protect the environment. La Chaudière produces their organic cheese by traditional methods with great care given at every stage. They improve upon and surpass the standards to give you the healthiest organic dairy products available. Uses only ORGANIC milk to make its cheese. NO ANTIBIOTICS OR HORMONES are given, and only grain grown without chemicals and GMO’s is provided for feed. Uses NO COLOURING. The organic cheese making process creates its own natural colour. Uses MICROBIAL ENZYME instead of rennet. 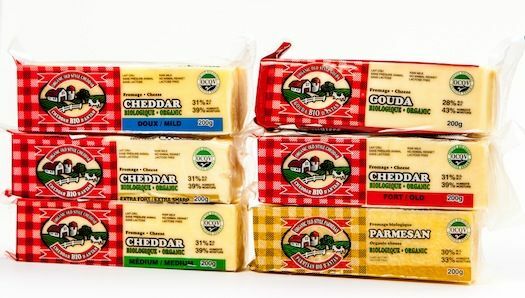 Presents a full line of specialty dairy products that have found a NICHE MARKET for those who enjoy delicious, full-flavoured cheeses from organic sources and those with special diet considerations.